In tightly covered container, shake all salsa ingredients until well blended. Reserve 1/4 cup salsa. Stir onions and tomatoes into remaining salsa; set aside. Heat coals or gas grill for direct heat. Place steak and bell pepper on grill rack. Cover and grill over medium heat 15 to 20 minutes, turning bell pepper frequently and beef once, until desired doneness. Sprinkle beef with salt and pepper. Cut beef into 1/4-inch slices. In medium bowl, mix beef and reserved 1/4 cup salsa. Cut bell pepper into strips. 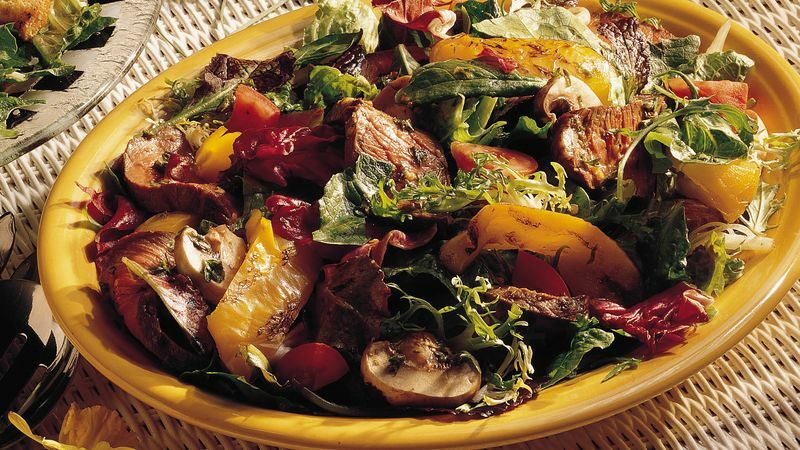 In large serving bowl, place salad greens, bell pepper, mushrooms and beef. Add remaining salsa with onions and tomatoes; toss to mix. Look for ready-to-serve salad green blends in the produce section of your grocery store. Planning a get-together? Sangria and corn bread sticks go well with this sumptuous salad.